Citation rate is a measure of research quality. 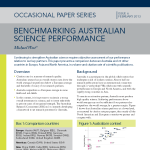 Australian science has an overall citation rate above the world average, but performs below a European average and the levels of many of our research partners. Australia outperforms a European average in some fields and sub-fields. In this context, it is important to maintain a strong overall investment in science, and to invest selectively in priority areas of recognised strength. The Australian Research Committee (ARCom) is currently developing a framework to set research priorities for Australia. Australia is a participant in the global collaboration that underpins much of modern science. Almost half our research publications have an international connection through co-authorship. We collaborate with scientific powerhouses in Europe and North America, and with the rapidly rising countries in Asia. To remain an attractive partner, Autralia must produce high quality science. Achieving performance above world average may not be sufficient if our partners also outperform the world average, by a greater margin. 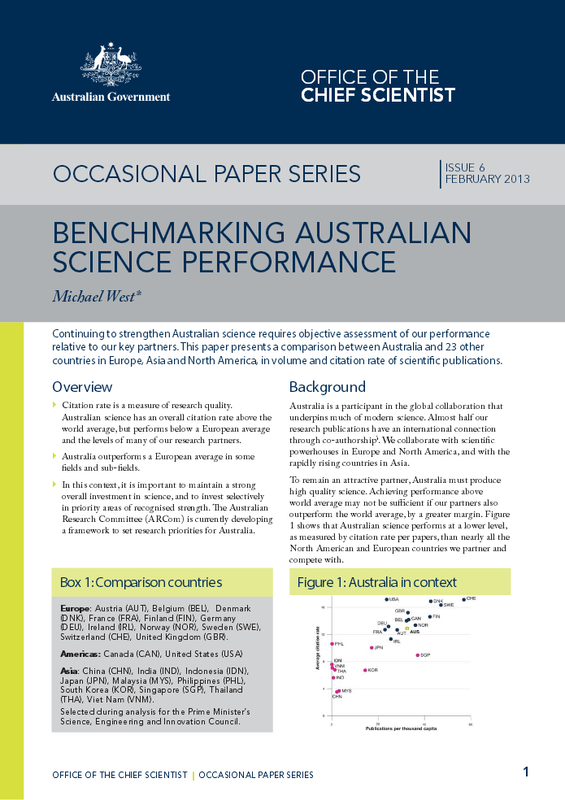 Australian science performs at a lower level, as measured by citation rate per papers, than nearly all the North American and European countries we partner and compete with. Posted in Asia Pacific, BioTech, Business Intelligence, Cloud Computing, Communications, eHealth, Information, Medical Devices, Nanotechnology, Security, Technologies, Web 2.0 and tagged ARCom, Australian Research Committee, Australian science, citation rate, investment in science, modern science, research partners, research quality, scientific powerhouse.